I know it seems unfair. I know that the hours of sweat, preparation, and devotion weren’t meant to reap silver. I know that there will always be that “what if” thought for years to come. Or that “we were one game away.” I know those tears were real, and those post-game smiles for the cameras were separated by a chasm of thoughts; a chasm of indescribable emotions. I know it’s the art of almost that doesn’t quite seem like an art at all; rather, a painting completed until the final brush stroke, leaving the last necessary detail incomplete. I know it doesn’t seem like an art at all, but it is. You played 31 games this season, and you won 24. You were in a tournament with 16 of the top teams in California, and you finished second. This was your second CIF Championship game you’ve played in in the last two years. That is an art, and that is skill. And more than anything, that is a reason for you to hold your head high. Every time you put leather to hardwood, you give green and gold it’s character; virtuous, tenacious, and strong-willed. Don’t bury this beneath your thoughts. Don’t forget your leadership, your drive, and your ability to dig deep when it counts the most. 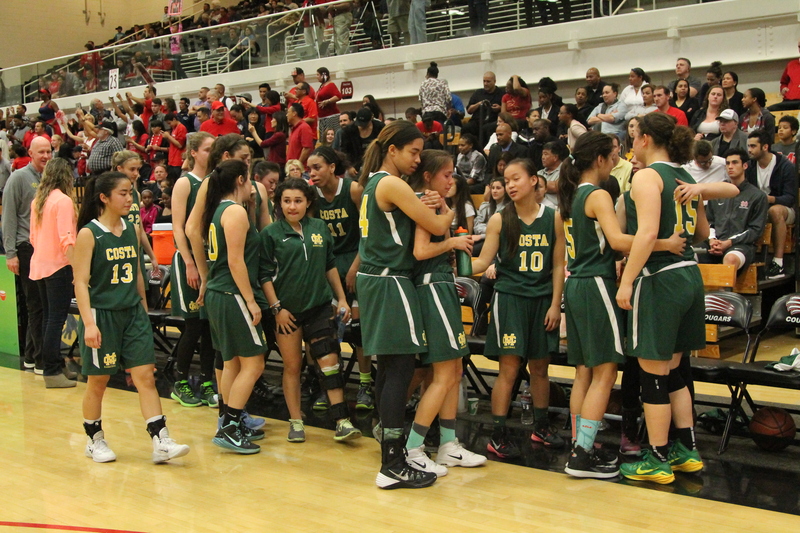 People fear Mira Costa girls basketball, and they have a good reason to: they know that no team works harder to get where they are than you guys do. They know that even if they take a 14 point lead late in the third quarter, they’re not safe. They know that every single player on Mira Costa is willing to leave everything they have out on the court. You can’t blame them for being scared. It gives me chills just watching. I’ve reported almost every sport and hundreds of games, yet this kind of passion is rare. This is something more than wanting a ring: this is wanting to cry tears of joy with your teammates, form unforgettable memories, and bring back the gold plaque to Mira Costa. Ladies, you already brought back the gold plaque; the only one we need. You brought back pride for our school, and you gave us all the representation that every other school only dreams of having. And for that, communally, we thank you. Immensely. And to Coach Lapham, one of the most humble individuals I’ve ever had the pleasure of meeting, thank you for never giving up. And thank you for giving this team and this school such amazing athletic opportunities. You are a true professional, through and through. That being said, this passage is not a eulogy for Mira Costa girls basketball, only a reassurance and a motivation. Because I, along with everyone else at Costa, know this dynasty is far from over. And the redemption starts on Wednesday, March 11, in the CIF State Championship tournament. Get back out there lady Mustangs, and go show them what green and gold is all about. Again.